The government today released the names of 20 of the Malaysian victimsof the MH17 tragedy whose remains will be flown from the Netherlands to Malaysia tomorrow. Eleven of the victims are Muslim and nine are non-Muslim, said Defence Minister Datuk Seri Hishammuddin Hussein. Eleven of them were passengers on the ill-fated Flight MH17 that went down in eastern Ukraine on July 17, and nine were from among the 15 crew, he told a press conference. The press conference was held following a meeting of the coordinating committee on the ceremony to honour the victims of the MH17 tragedy that will be held at the Bunga Raya Complex of the KL International Airport (KLIA) here. Also present at the press conference were Communications and Multimedia Minister Datuk Seri Ahmad Shabery Cheek, Transport Minister Datuk Seri Liow Tiong Lai, Rural and Regional Development Minister Datuk Seri Mohd Shafie Apdal and Women, Family and Community Development Minister Datuk Seri Rohani Abdul Karim. The 11 passengers whose remains would be brought tomorrow were Foo Ming Lee (male); Karamjit Singh Karnail Singh (M); Ng Qing Zheng (M); Mabel Anthony Samy (female); Paul Rajasingam / Sivagnanam (M); Elisabeth Ng Lyeti (F); Ariza Ghazalee (F); Muhammad Afif Tambi (M); Noor Rahimmah Mohd Nor (F); Mohd Ali Md Salim (M) and Hasni Hardi Parlan (M). The nine crew whose remains would be brought tomorrow were Mastura Mustafa (F); Ahmad Hakimi Hanapi (M); Hamfazlin Sham Mohamed Arifin (F); Nur Shazana Mohamed Salleh (F); Dora Shahila Kassim (F); Lee Hui Pin (F); Angeline Premila Rajandaran (F); Chong Yee Pheng (F) and Azrina Yakob (F). Hishammuddin said 17 of the 20 remains would be brought in coffins while three would be brought as ashes in urns. "The cremated remains are those of Elizabeth Ng, Lee Hui Pin and Angeline Premilla Rajandaran," he said. 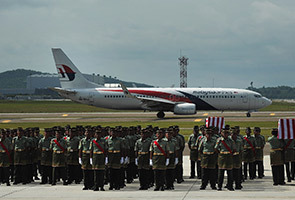 The minister said 13 of the remains would be taken to cemeteries in hearses and seven would be flown to the respective states in C130 aircraft and EC725 helicopters of the Malaysian Armed Forces (MAF). Five of the remains would be flown by C130 aircraft to the Kuching International Airport (two remains) and the Sultan Azlan Shah Airport in Ipoh (three remains) while two more remains would be flown by EC725 helicopters to Pagoh and Segamat in Johor. Hishammuddin said the remains of eight more Malaysian victims had been identified but were still in Amsterdam awaiting certain procedures and would be brought to Malaysia soon in batches. "We are working on bringing the second batch of remains on Sunday," he said. Meanwhile, Liow said the remains of two more Malaysian victims were identified yesterday, raising to 30 the total number of remains identified. Forty-three Malaysians were killed when Flight MH17, flying from Amsterdam to Kuala Lumpur on July 17, went down in eastern Ukraine. The Boeing 777-200 aircraft, carrying 283 passengers and 15 crew, is believed to have been shot down over the troubled country. Liow said efforts would be made to bring the remains to Malaysia soon, and that another ceremony to receive the remains would be held on Sunday. "As of now, two remains were ready to be brought to Malaysia on Sunday," he said. Liow said the Transport Ministry would provide updates from time to time. "We have teleconferencing everyday on bringing the remains to Malaysia," he said. The government has declared Aug 22 as a day of national mourning.